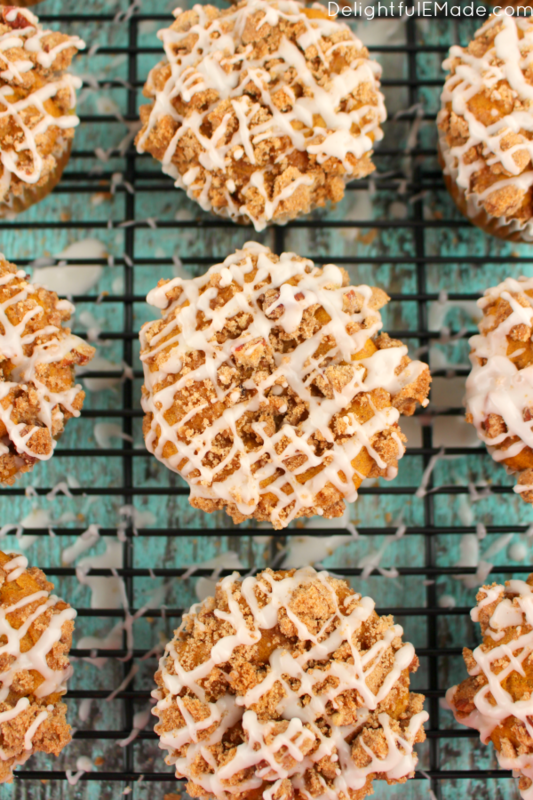 Pumpkin muffins just got a major upgrade! 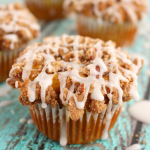 These Pumpkin Apple Streusel Muffins are wonderfully moist, with big chunks of apples baked inside with a delicious pecan streusel and glaze on top. Bakery quality muffins right at home! I know I’ve said it before, but its totally worth saying again; I absolutely LOVE fall! It is hands-down my favorite time of year. 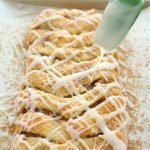 College football, apple-picking, back-to-school, cool crisp weather, and most of all, the smell of cinnamon baking in the oven! 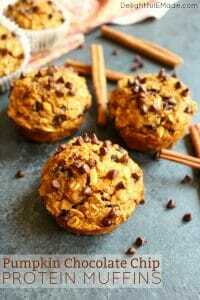 This recipe for pumpkin muffins is nothing short of the perfect fall breakfast treat! 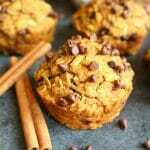 Pumpkin muffins are such a great way to enjoy a home-baked, delicious treat on a cool, fall morning. Making a batch of these ahead of time for busy mornings. Wrap in plastic wrap and then freeze for a quick grab-and-go treat whenever you’re in the mood. Simply pull these out of the freezer the night before, let them thaw on your counter overnight, and you’ll have a tasty, delicious muffin to go with your morning coffee on the way out the door! My 7-year-old absolutely loves these pumpkin muffins! The big chunks of apples along with the moist, delicious pumpkin make an amazing snack or after-school treat. 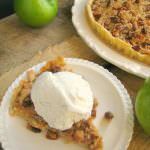 I personally love the delicious pecan streusel topping! 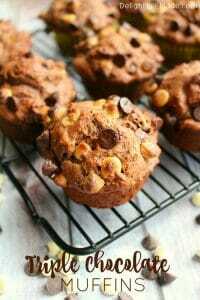 The sugary, crunchy nuts go so wonderfully with the moist, delicious muffin below it. The glaze is literally the icing on the cake – it looks very pretty, too! These muffins make for a great treat for your PTO meeting, work break-room or a nice treat to share when you have friends over for coffee. You may want to make a double batch, as these muffins go fast! 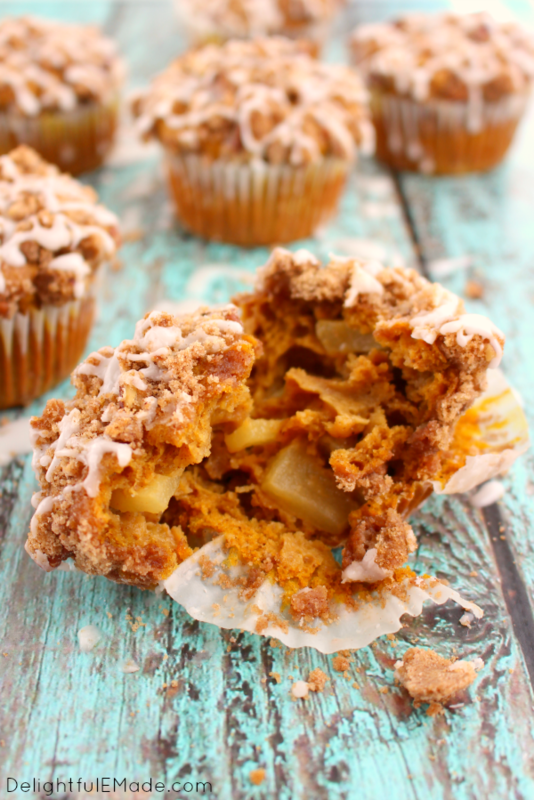 The big chunks of apples in these pumpkin muffins are tender and the perfect compliment to the streusel topping! This is such a great way to enjoy all the apples you’ll be bringing home from your fall apple-picking trip! 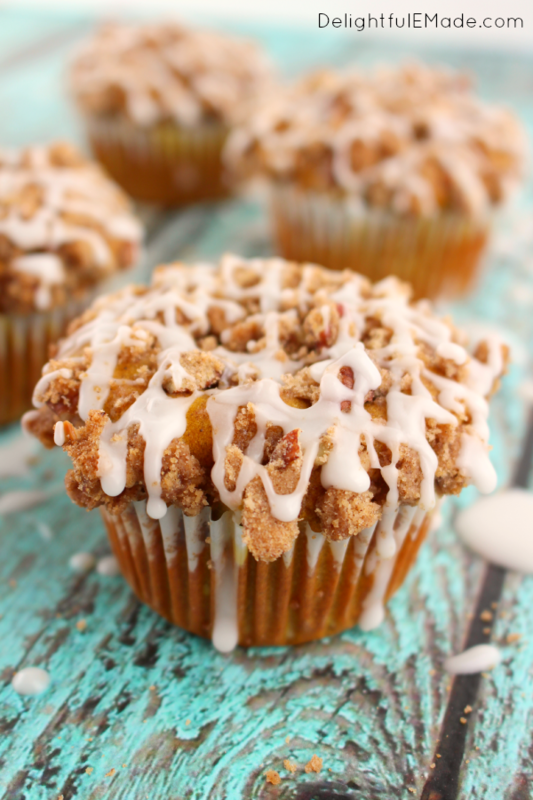 All of your fall favorites in one delicious breakfast treat! 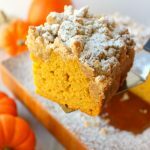 These Pumpkin Apple Struesel Muffins are wonderfully moist, with big chunks of apples baked inside with a delicious streusel and glaze on top. Bakery quality muffins right at home! In a medium bowl mix together the dry ingredients: flour, brown sugar, baking powder, soda, salt, cinnamon, nutmeg and cloves. Whisk together to combine. Set aside. In a large mixing bowl, combine the pumpkin puree, yogurt and eggs. Gradually add the dry ingredients to the wet until all are well incorporated and combined. Fold in the apples. Prepare the streusel by combining the flour, cinnamon and brown sugar. Drizzle the melted butter over the mixture and stir until crumbly. Add the chopped pecans and stir to combine. Spoon or ladle the batter into the prepared cupcake pan. Each cup with be nearly full. 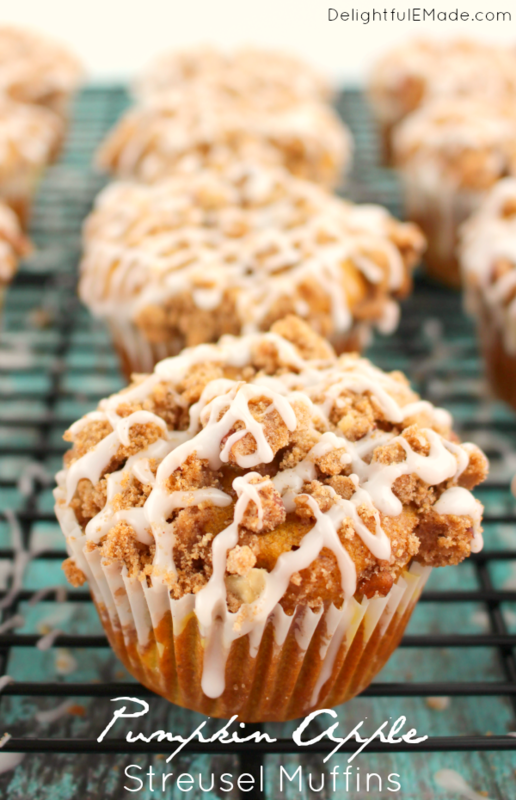 Top each muffin with a generous amount of the streusel topping, divided evenly over each cup. Bake at 350 for 24-26 minutes or until a toothpick inserted comes out clean and crumb-free. Let cool for 5-10 minutes before removing muffins from pan. Let cool completely on a rack. Mix together the powdered sugar and milk for the glaze and drizzle over the cooled muffins. Enjoy right away. Freeze or refrigerate any leftovers in an airtight container. 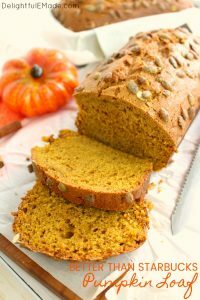 this is the PERFECT fall breakfast!! Oh my gosh, I am drooling!! Yum!! Thanks for linking up with us at the Best of the Blogosphere! YUM! 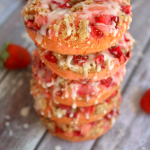 These look wonderful, I wish I had one for breakfast now! They look delicious. I must try them. I can smell it from here! And I'm just reading this! These muffins are absolutely GORGEOUS and sound so perfect for the fall. 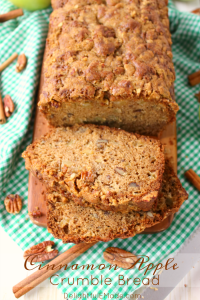 I'm a huge fan of pumpkin and apple, so combining them into this breakfast is brilliant! Just wanted to stop by from the SITS Saturday Sharefest and say hello! Happy weekend to you! These look absolutely amazing!! I'm definitely going to give them a try this fall. I'm sure my kids will gobble them right up! Thanks for linking up with us at the Best of the Blogosphere! These look incredible! My son would eat muffins for breakfast every day if I let him and I know these would be a huge hit. Popping over from the chicken chick's blog hop!! This recipe sounds amazing! 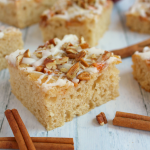 Perfect for fall and I love cooking with greek yogurt! 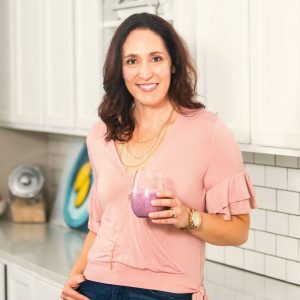 I make my own yogurt then strain it for the creamiest greek yogurt! 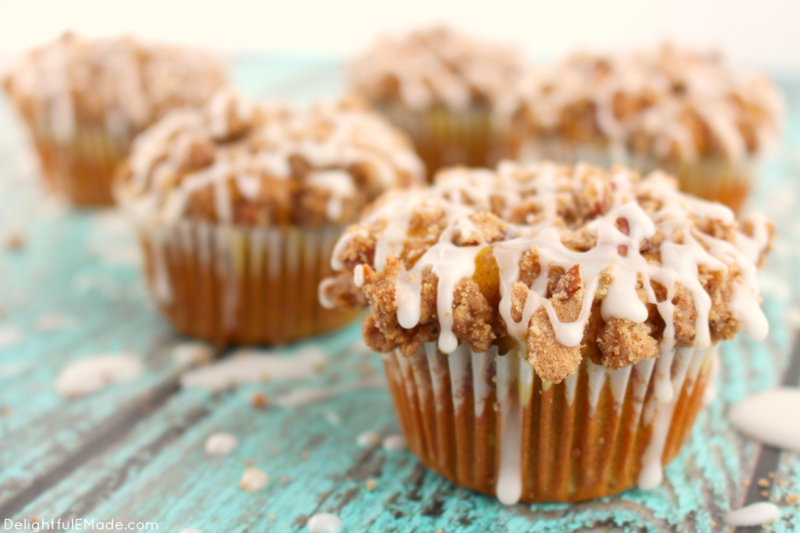 Erin- this is everything I want in a muffin- all my favorite flavors for fall! Thanks for linking up to the Handmade Hangout! I will be featuring this today on my blog when the new linky goes live at 6pm ET. I hope you'll stop by to see your feature and link up again! What a gorgeous blog you have! And these muffins look amazing. I'm delighted to be following you now! Thank you for sharing on #OMHGWW this week!! 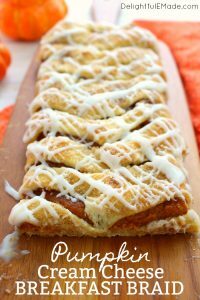 They look amazing and I LOVE strudel!! Pinned! These look amazing and are just perfect for fall. Yummy, perfect for fall. Thanks for sharing at Merry Monday! Oh my heck! These look amazing!